Why have a Promotion Board? The purpose of The New Hampshire Christmas Tree Promotion Board is to promote and support the New Hampshire Christmas Tree products industry through the implementation of effective programs and activities to enhance awareness of the industry, increased sales and utilization of real Christmas and associated products, and further the interests of the Christmas tree growers of New Hampshire. Development of a logo for the promotion board including production of letterhead and envelopes for official business. Promoted Christmas trees at "The Big E" farm show each year. NH Building. Staffed booth, display trees, wreath demos, balsam pillow. Gave money to the "New Hampshire We Have a Story to Tell" development and now have a standardized story for tags for growers to use. Did a placemat promotion with Burger King during the holiday season. Arranged to have "real trees" in rest areas throughout the state. Have designed and produced a Christmas ornament each year which is sold wholesale to raise money for promotions. 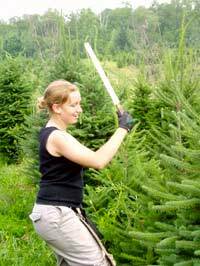 Provide money to help offset costs for Christmas tree information surveys. Set up and staffed booths at shows to promote real trees. As you can see many things have been accomplished so far, but we are always in need of help and new ideas. Please call 603-271-3788 if you would like more information about helping promote your industry.